We are here; fairly innocuous words that little prepare the reader for the tightly written thriller that Michael Marshall has penned. It all begins with the struggling author David and his wife Dawn visiting the publisher in New York who has finally agreed to print his debut novel. As he returns to the train station to get home he literally bumps into a stranger who whispers into David's ear two little words "Remember Me". A passing bizarre encounter turns even more peculiar when the same stranger turns up in his home town and David becomes a little concerned. Just what does this guy want? Back in New York John and his girlfriend Kristina try and help a woman Kristina met at her book club who believes is being followed but has never got a clear enough look to alert the authorities. As you might expect, things are not as they first appear and the story that unravels challenges the reader to pay the strictest attention and enjoy the thoughtful, cerebral puzzle that is "We are here". The deft prose and rich characterisation is an absolute joy, as is the slow, deliberate pace and realistic edge that manages to underscore the otherworldly nature of the story. This style of writing creates a real sense of plausibility to the otherwise outlandish and also helps to create a sense of tension that at times feels almost tangible. The central idea to the plot is not only inventive and refreshingly different but also quite thoughtful too, playing on themes of life, death, religion, sanity and psychology. The slower pace works well to highlight the tension too, the author has a brilliant way of making things suddenly jump from an otherwise sense of calm; I loved how this played out and I could quite happily have continued reading long after the book finished. The dialogue is genuinely witty, creative and thoughtful; a confident voice with an assured manner that encompasses the reader in and makes those jumps the more powerful. The ending is perfectly played out, building the tension to a cresendo that delivers on the many hints presented through the journey. 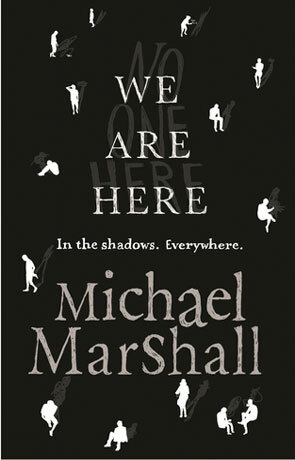 We are Here is one of those books that is mainstream enough to be enjoyed by most readers; a subtle, intelligent story delivered with creativity and perspicacity - above all a great read. Written on 14th March 2013 by Ant.